One champion crowned, one challenger disappointed. But who was who? This is your extended format F1 UPDATE! for the Brazilian Grand Prix! *SO IT BEGINS: The crowd at Interlagos was in good voice today when the cameras went live for today’s Grand Prix of Brazil, and fervently behind their favorite son, Felipe Massa. Seven points behind in the Driver’s Championship and needing to win, the Ferrari driver was on pole and protected nicely by his teammate, Kimi Raikkonen. His opponent, Lewis Hamilton, was fourth on the grid, on the dirty side of the track, with his biggest threat, HWMNBN, right behind him. 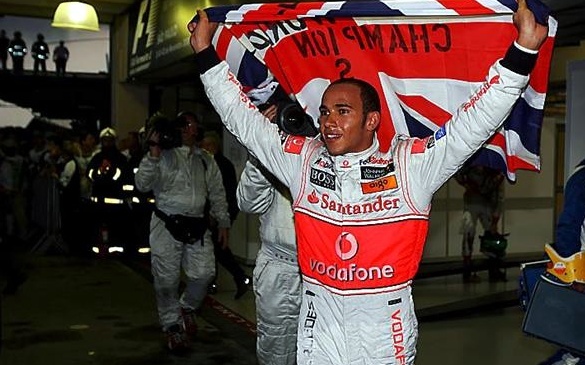 The McLaren driver didn’t need to win the race, however, or even be on the podium. He just needed to finish 5th or better and it wouldn’t matter what Massa did: he’d be the Driver’s Champion. He’d been in this position before, though. In 2007, he held a seven point lead over Kimi Raikkonen… and peed it down the leg of his firesuit. On this day, for the premiere Championship in motor sports, nobody else on the grid mattered except how they’d hinder the progress of the two challengers on their way to the checkered flag. The Gods of Auto Racing, though… they mattered. *TIMING IS EVERYTHING: Ten minutes before the race was to start, the Legendary Announce Team for SPEED Channel’s coverage threw it to commercial. It was bright and sunny. Three minutes later, when they came back from commercial, we were told that the start of the race would be aborted for ten minutes. During the break, a massive cloudburst had drenched the Autodromo Juan Carlos Pace, and while it had stopped and didn’t look to start again anytime soon, it had been torrential enough to force the teams to change tires on the grid. As tires had to be in place on the cars three minutes before the recon lap begins and the storm hit at about five minutes before, the race stewards called the aborted start in the name of safety. This caused a flurry of activity amongst the teams and drivers as they tried to figure out what to do. The track was wet, yes, but the sun was back out and shining brightly. Throw in the thundering progress of twenty sets of tires over the asphalt, and a dry line would emerge very quickly… but would it be quickly enough to run drys, or should they put on Intermediates? In the end, everybody chose to go safe and put on the Inters. A good thing, too. There was a small, swift river flowing from Turn 2 down towards Turn 3, and indeed, this part of the track would never truly dry out during the course of the race. The rest of the circuit was soggy, but even after the recon lap you could see a definite dry line forming. The 20 cars made the lap around uneventfully, but BMW’s Robert Kubica dove into the pits at the end, either for mechanical issues or a different set of tires. *LIGHTS OUT: From the start Felipe Massa, showing the mastery one would expect of a driver at his home track (literally; he lived 300 yards from the fence surrounding the circuit), rocketed off the line. Indeed, it was a good start for everybody in the first few grid rows. Renault’s HWMNBN gave Hamilton a brief scare, diving inside him into the first turn, but Lewis managed to keep him behind. A clean start all around until you got towards the back of the pack. Nelson Piquet Jr, driving in front of his home fans, wound up backwards in the gravel trap between Turns 1 and 2, his car broken in some manner that the cameras either didn’t catch or SPEED didn’t choose to replay. Those two were the only retirees from the race. Once the racing line dried enough to switch to dry tires, the racers began to make their way into the pits, beginning with Robert Kubica from 17th, and generally working its way up the field from there. At the end of this round of pit stops, the order stood Massa, Trulli, Raikkonen, HWMNBN, Hamilton, and Hamilton’s teammate Heikki Kovaleininninnie. Jarno Trulli eventually slipped back out of the way of the heavy hitters, sliding around on the wet pavement enough that he fell behind Hamilton and Heikki. While there was still a lot of racing left to come, Hamilton had to be feeling good. He was in fourth place, more than good enough to win the Driver’s Championship, and with his teammate behind him to run interference, it didn’t look like he was going to be challenged anytime soon. Let Massa win the battle, Hamilton would win the war. And that’s the way it stayed for the next hour and change. *TIMING IS EVERYTHING, PART II: With around 15 laps to go, we got to hear a snippet of radio communication from the pit wall to HWMNBN: “Rain expected in 10 minutes,” or about four laps remaining. At that moment, the top of the field was Massa, HWMNBN, Raikkonen, Hamilton, Kovaleinninninnie, the wunderkind of the Toro Rosso team Sebastian Vettel, and Toyota’s Timo Glock. The rain actually began to fall with six laps or so remaining. Those at the back of the field again set the tone for the rest of the bunch, starting with BMW’s Grizzly Nick Heidfeld. Being out of the points, they had nothing to lose by stopping and switching to wet-weather shoes. With four laps remaining, everybody had stopped for rain tires… except for Timo Glock. If the rain stopped, or stayed low-intensity, he was going to get a podium easily, perhaps as high as second. When everybody was done getting galoshes, the standings were Massa, HWMNBN, Kimi, Glock, Hamilton, Vettel. Lewis no longer had any places to give away as he had before the rain. Being the best rain driver, however, he couldn’t have been too concerned. But then something interesting happened. Sebastian Vettel, winner of the wet race at Monza, quickly announced to the racing world that he, and not Hamilton, was Der Regenmeister, and with two laps remaining passed Hamilton cleanly. A look in the Ferrari pits showed a jubilant group of mechanics and Massa family members; another look in the McLaren pits revealed the polar opposite: a shocked and sickened bunch of mechanics and Hamilton family members. What was most amazing was that Vettel began to pull away from Hamilton. While the McLaren would slowly make up ground on the straights, the Toro Rosso would actually pull away coming out of the turns. There was nothing Lewis could do as his Driver’s Championship slipped away for the second straight year. Felipe Massa, fully forty-five seconds or more and nearly three-quarters of a lap ahead of Vettel/Hamilton, crossed the line with a dominant victory. His family exulted, his extended family of Brazilian race fans (that’s a lot of fans, and for once, that isn’t intended to be a joke) released a roar that could probably be heard in a stone-silent London. Hamilton kept pushing and doing everything he could to get in touch with Vettel, frantically struggling to get close enough to the Toro Rosso to legitimately attempt a last desperate pass. It was all in vain, however, as it seemed like all his trying served no purpose but to maybe drop him farther back. And then the Gods of Auto Racing cleared their throats. *THE END OF A DREAM: In his Toyota, Timo Glock was having a miserable couple of laps. Not known as a wet-weather warrior in the best of circumstances, the rain kept coming down and his dry tires just weren’t holding onto the pavement. His hopes for a podium were long gone, but maybe fourth was still attainable. He fought his balky car through every turn, sawing desperately at his steering wheel. The Vettel/Hamilton struggle was closing in on him, but there were only three turns left… surely he’d be able to keep the car on track and bring home one of Toyota’s best finishes this season. On Turn 14, the gentle high-speed left handed blow leading towards the Pit-In, all of Timo Glock’s efforts and flop sweat came to naught as he skidded and wobbled and nearly lost the car altogether. What he did lose, however, was whatever momentum he may have had. Vettel and Hamilton swept past his floundering Toyota like he was standing still. The 2008 Season had come to an incredible, unbelievable end. *DRIVER OF THE RACE: Sebastian Vettel challenged the World Champion in an inferior car in wet weather... and beat him, nearly stripping the championship from his hands in the process. Yeah, that gets a DotR award. *TEAM OF THE RACE: Ferrari gets a consolation prize by winning the Constructor's Championship and the race. There's never been a team more crushed by a victory. *MOVE OF THE RACE: It was the most important pass of Lewis Hamilton's young career, his pass of a wallowing Timo Glock. It wasn't challenging in any way, but it was still the MotR. *MOOOOOOO-OOOVE OF THE RACE: Ferrari's celebration of their Driver's Championship before the race was over. Wow, that's gotta hurt. And so it ends... until next season. Congrats to Lewis Hamilton and Ferrari, and thank you for reading F1U! Post contains 2504 words, total size 19 kb. That's really a pity about DCC. Not the way you'd want to remember your last race. I think the single best thing about this season is the way BMW-Sauber performed. Now it's a three-team competition, which is much more fun than just two. 3 Av, no, not really. It's a tribute to my alltime favorite quote of his, where he called his entire race "pants, just bloody pants." First, BRAVO to Wonderduck for another outstanding season of F1 UPDATE!!! You're the best!!! As for the race...wow. I felt so bad for Massa with victory snatched away the way it was. That was the saddest podium I've ever seen. Was there any kind of ceremony at the track for Hamilton winning the championship? 39kb generated in CPU 0.05, elapsed 0.2008 seconds. 47 queries taking 0.1689 seconds, 247 records returned.